You know how it is with kids – they want to be comforted at night whenever it starts to get all dark, and some of them find it difficult to get to sleep if parents do not chase out all the (imaginary or otherwise) monsters out of the room, if any. Well, a little bit of light might provide courage to your little ones to sleep alone at night, and you probably won’t go wrong with the $79.99 Glo Nightlight with Glowing Balls. 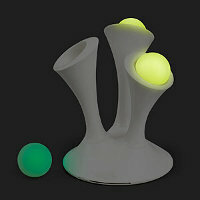 I must say that the Glo Nightlight does somewhat resemble alien plant life to a certain extent, where it features three stems that hold a glowing ball each. At the base lies the secret to its “life” – it is where those lights get charged, so whenever it becomes dark enough, the balls will light up to provide some level of illumination, giving enough light to see what’s going on around while not being too bright that one cannot fall asleep. It will last up to 30 minutes though, so make sure your kiddo enters dreamland by then.